Can’t decide between a croquembocuhe and a wedding cake? 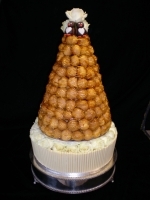 This couple chose a 12″ rich chocolate cake to serve 75+ guests, decorated with white Belgian chocolate curls, and we topped it with a thick band of fresh ivory roses and a 200 piece croquembouche. A rather untraditional chocolate penguin “bride and groom” topped it off.